Original CSF-3 Super Feeder serviceable for years to come, made in USA and sold by Super-Feed for over 23 years! All parts readily available and easy to replace if ever needed. Many modes of operation, indoor or outdoor applications and ease of maintenance and repairs. Trusted brand for years and years by thousands of customers. 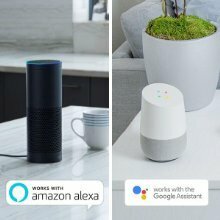 See example how Alexa works for a customer using voice activation. SPECIAL OUTDOOR PACK FOR CSF-3 QUART (compact at 4 and 3/4 cups capacity which can be increased later if needed-physical size: 7 1/4" x 3" deep x 12" tall) This feeder comes with installed chute cover, outdoor approved power adapter with 6' cord and plug to reach timer and outlet, 7-Day outdoor Super Feeder approved digital timer for up to 20 daily feed cycles and 50 feet of wire to reach your feeder from the outlet/timer. 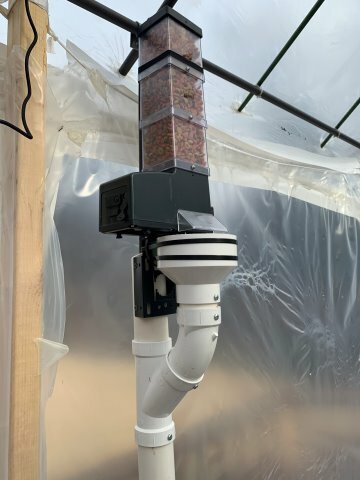 Also included is a small indoor type power supply the feeder’s box ONLY used to adjust feed cycle time (portion) in the comfort of your home before mounting feeder outside, after which time you will ONLY use the outdoor power supply to operate your feeder once mounted outside. With this package, it is recommended that you strap the upper hopper clear extension with an additional metal strap (not supplied but available) or other method of your own. CHUTE COVER IMPORTANT NOTE: EVEN THOUGH THE CHUTE COVER WILL PROTECT THE CHUTE OPENING FROM THE OUTDOOR ELEMENTS, IT WILL NOT PROTECT INTRUSION BY LARGE ANIMALS, PARTICULARLY RACCOONS WHO COULD BREAK IT OFF. THE CHUTE AREA SHOULD BE ADEQUATELY PROTECTED BY AN EXTERNAL DEVICE OR THE FEEDER INSTALLED IN AN ENCLOSURE OF SOME TYPE AS SHOWN THROUGHOUT OUR WEBSITES WITH PAST CUSTOMER PICTURES. 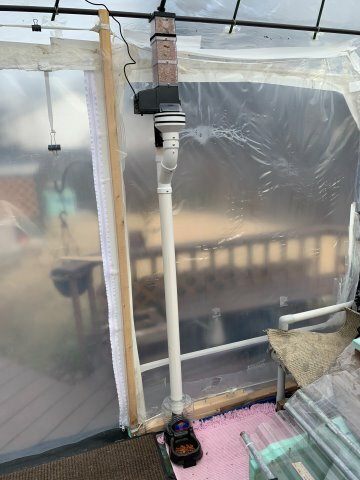 Also, if you are not going to protect the whole feeder with an enclosure of some type, you should fasten the upper clear 2-cup extension to the mount to make sure both cannot be ripped off. You may purchase an extra metal strap available from this site to do that. The XL model does not need that because the large hopper comes with an extra strap. NOTE: Small 1/4" round (spherical) kibbles like offered by Science Diet or other brands are recommended for best portion accuracy, but most other kibbles will work fine up to 5/8" diameter with perhaps a slightly reduced portion accuracy. Please be aware that the feeder will not “count’ kibbles, but tests have shown that an overall portion accuracy of +/- 0.1 to 0.2 ounce from one portion to another is possible with recommended kibbles. but with so many shapes/sizes of kibbles on the market, it is impossible to predict exact results as far as exact accuracy is concerned. Although performance is guaranteed with recommended food as described, please be advised that due to variance of kibble sizes and shapes, 100% portion accuracy simply cannot be guaranteed for all feed cycles. That would apply to any feeder other than one with pre-filled compartments. We recently became a sponsor for a "Blue Collar Cat" in Washington, DC. (Non-adoptable feral cats are placed with a sponsor family or company needing rodent abatement.) 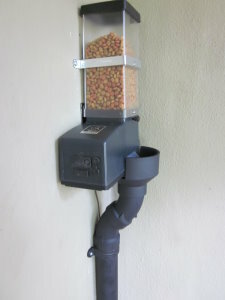 We purchased a superfeeder CSF-3 with the outdoor adapter, and in Dec installed it in the new feeding station. It was easy to put together with the online instructions, and thus far, works as advertised. I bought this feeder based on reviews from outdoor/feral cat websites, and think we will be happy with it. It is sturdy and can be installed many different ways. I didn't realize this outdoor adapter package did not come with the bowl and stand ... and customer service was VERY helpful and timely in getting one out to me (thank you!). 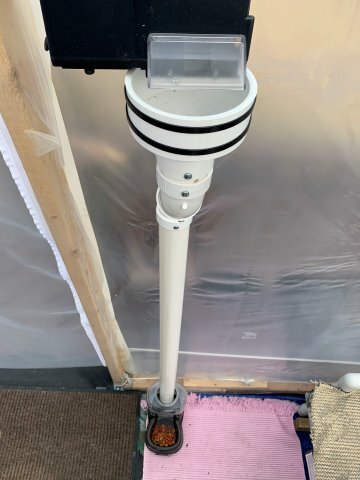 Once our cat is ready to leave her enclosure in a few weeks I have a few ideas for rodent and insect proofing an urban feeding station, and will send photos. TS-08/24-Hour Programmable Time Switch--6-24 VDC or AC.